The 10th annual Autism Walk-a-thon, benefiting the Autism Society of Oregon, will be held at Oaks Park on Sunday, April 15, 2012. Register now at www.firstgiving.com/asoautismwalk. Registration desks open at 9:00 a.m, walk starts at 10:30 a.m. and Oak Park rides open at 11:00 a.m. ASO will be selling discounted ride bracelets at the registration event. Set up your personalized fund raising page today! *Top 3 on-line fund raisers will receive a gift certificate at the Walk! To print out flyers for the 10th Annual Autism Walk-A-Thon, click here. To print out a pledge form for off-line donations, click here. QUESTIONS? Please call the AUTISM SOCIETY OF OREGON at (503)636-1676, or 1-888-AUTISM-1 (toll-free), or send an e-mail to: info@oregonautism.com. 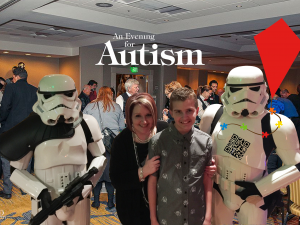 This entry was posted in Autism Awareness, Calendar, Fundraisers, News and Updates. Bookmark the permalink.